A tornado ripped through Kansas and propelled Dorothy Gale into a magical world as the theatrical version of The Wizard of Oz conveniently landed at the Covedale Theatre. Based upon the landmark, original Hollywood musical from 1939, this “wizard” faithfully follows the iconic film. The secret of the original was its charm, the music (Harold Arlen), witty lyrics (E.Y. Harburg) and great chemistry as an intrepid band of four overcome fear, adventure, magic and witches (both evil and good). Since everyone knows the movie and has high expectations walking through the door, doing a theatrical production of this show can be daunting. I’m pleased to say that the Covedale production is up to the task. We’ll start with an excellent cast of some CLP veterans and rookies led by a delightful Dorothy played by NKU sophomore Ally Davis. Davis is equally fetching and effective as the awestruck Dorothy who knows she is no longer in Kansas but fights through her fears and bewilderment as she struggles for a way to return home. Davis has a pleasant voice and sings “Somewhere Over the Rainbow” as the poignant plea for a better life. Her first encounter with “evil” comes when neighbor Miss Gulch (Michelle Wells) tries to have Dorothy’s dog Toto euthanized. 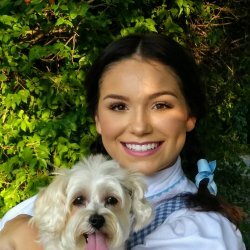 According to the playbill, Toto is portrayed by Macy Wiemen who is adorably cute and, thankfully, went through the entire play without any accidents. While in Kansas, Dorothy associates with many of the characters who will also appear in Oz as different characters including Wells as the Wicked Witch of the West, Erin Nicole Donahue (Auntie Em and Glinda), Brandon Bentley (Zeke and the Cowardly Lion), Jeremiah Plessinger (Hickory and the Tinman), Chris Logan Carter (Hunk and the Scarecrow) and Kyle Taylor (Professor Marvel, the Guard and the Wizard). Many in this group channel the actors from the film. Carter, as the Scarecrow, mimics Ray Bolger’s rubber-legged dancing style, Wells plays Margaret Hamilton with glee and Bentley is Bert Lahr personified, especially in his song “If I Were the King of the Forest”. They carry the show and they do it with élan. They also sing the marvelous score very well and articulate the clever lyrics. Music Director Ron Attreau leads a larger than normal orchestra which supplements the singers well. The ensemble is large and effective playing a variety of roles from Munchkins to crows to apple trees to citizens of Oz. Four youngsters (Nora and Ruthie Darnell, Raine Mari and Morgan Tracy) play Munchkins and Oz citizens. A combination of lighting and sound (Denny Reed), scenic design (Brett Bowling) and costumes (Caren Brady) propel the play from a drab Kansas farm to the technicolor Munchkinland, to dark and mysterious forests to poppy groves to Oz itself and to the lair of the Wicked Witch. All of these scenes have different requirements and I am always interested in how they show the tornado. The set in Kansas is dreary with colorless work clothes and clouds along the top of the stage. The tornado is hinted at first through the sound of the wind and then rotating lights superimposed on the set. When Dorothy first emerges in Munchkinland, curtains are pulled back to reveal a rainbow and the set is well lit. Suddenly, the Muchkins appear in a variety of multi-colored costumes. Glinda appears in a beautiful gown and the Wicked Witch is now green-faced and dressed in black. The costumes of the Scarecrow (who keeps losing his straw), Tinman, Cowardly Lion and Dorothy (blue and white gingham dress) are similar to the movie. And, of course, Dorothy inherits the red slippers. The poppies are represented by the ensemble dressed in red and green outfits. The Emerald City citizens and the backdrop are all in green. The effect of the technical enhancements plus the acting the direction by Bob Brunner and choreography by Jeni Beyer is a delightful, fun filled adaptation of the film. This is also a show that children should relish. There were some kids in the audience but more children should have the opportunity to see the show. So, grab your Halloween costumes (especially the witch ones) and follow the yellow brick road to the Covedale theater through November 18. This was written by Sheldon Polonsky. Posted on Friday, October 26, 2018, at 10:32 pm. Filed under Stage Insights News, Stage Insights Reviews. Bookmark the permalink. Follow comments here with the RSS feed. Comments are closed, but you can leave a trackback.